When the seasons change, there is at least one thing that you can always count on: potholes in the street. They are rough on your car, they make the whole street look awful and they are seriously annoying to drive over. Two artists are taking it upon themselves to call even more attention to these irritating problems with some fabulous art projects. 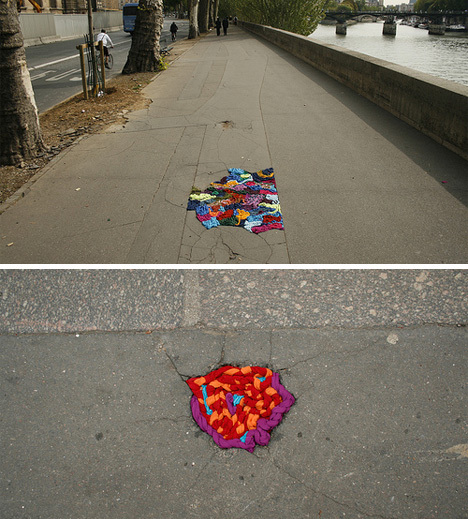 Juliana Santacruz Herrera made the streets of Paris far more colorful than usual with her “Project Pothole,” in which she filled Parisian potholes with colorful twists of soft fabric. The normally-rough and bumpy ride on several Paris streets was somewhat softened by Herrera’s efforts. Even more importantly, the sight of the streets was greatly softened with these small touches of beauty. 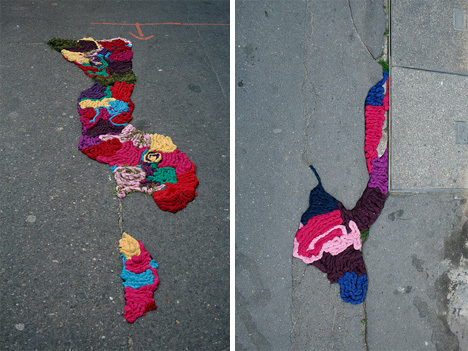 Miles away from the ugly quick slap-on patches that city crews would do, Herrera’s fabric interventions bring a bit of textural interest and bright joyful colors to the poor, neglected streets of the city. 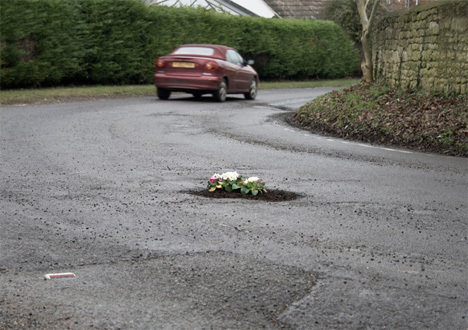 British artist Pete Dungey is similarly changing the dire landscape of pothole-riddled streets. 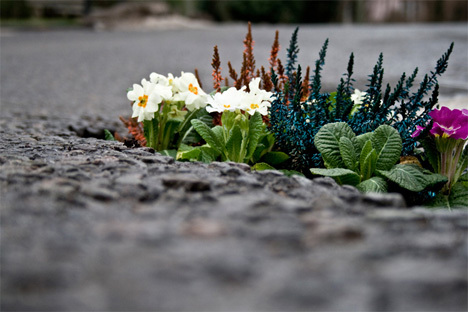 But rather than stuffing them with textiles, he plants tiny gardens in the newly-formed concrete cavities. 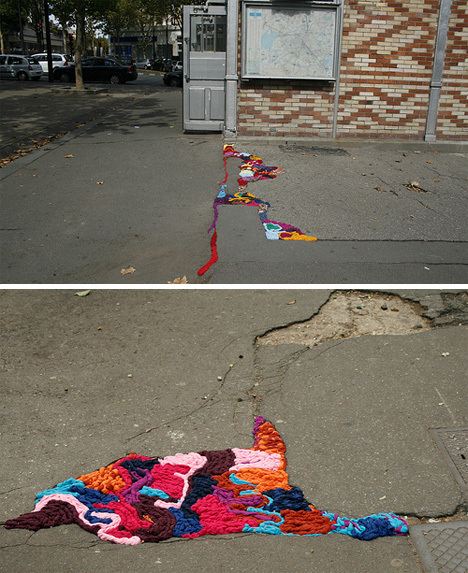 It is the ultimate combination of guerrilla gardening and street art. 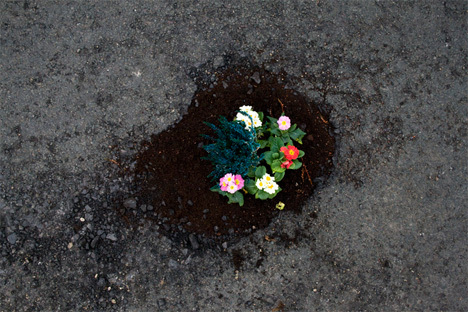 Working on the aged and sometimes treacherous bumpy streets of Britain, Dungey patiently arranges colorful plants in his pothole gardens. The tiny landscapes, he says, are meant to call attention to the imperfections of British roads. Most of us, of course, would go out of our way to avoid driving over such lovely little gardens. But at least if you have to suffer the indignity of driving over countless holes in the road, you can at least enjoy the sight of a few brightly colored flowers also.